Zidoo X9S is a high-end 4K TV box and HDMI recorder based on Realtek RTD1295 processor. I’ve already checked its hardware, and run some benchmarks, so after a successful OTA firmware update, I decided to test 4K videos and HDMI audio pass-through capabilities of the device with ZDMC, Zidoo’s fork of Kodi 16.1, and “Media Center” internal player. 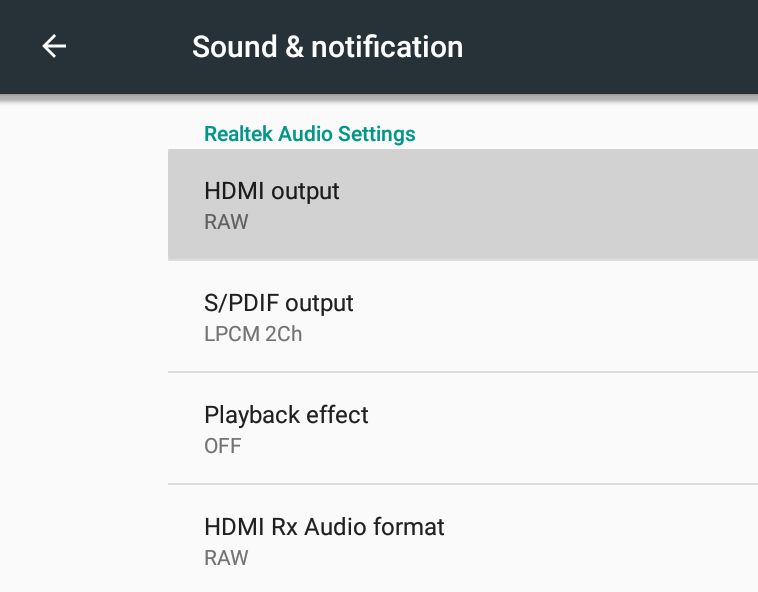 Before starting playing 4K videos and testing HDMI audio pass-through, you’ll want to make sure to configure video output to a 4K UHD resolution and framerate such as 3840×2160 @ 60 Hz, as well as change HDMI output audio in Sound & notification settings. The options are a little different from the other boxes as beside RAW and 2-channel LPCM, Zidoo X9S also supports multi-channel LPCM. In order to test HDMI audio pass-through, it must be set to RAW. 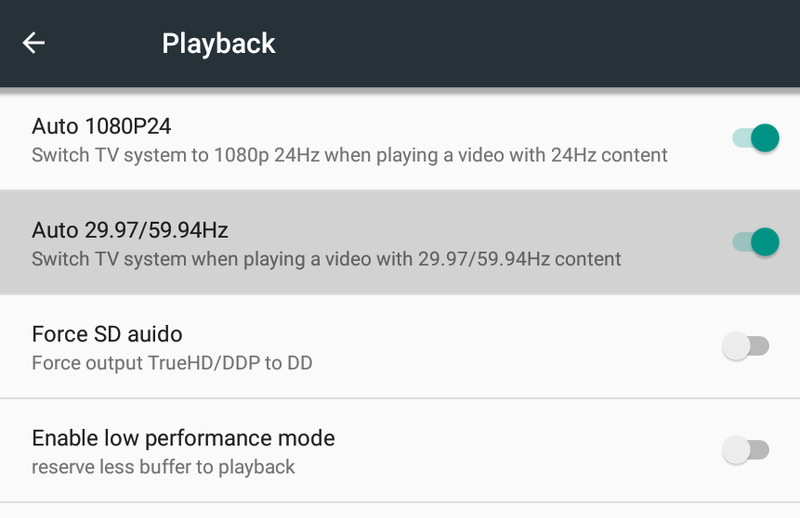 You may also want to check Playback options to switch to 24 Hz or 29.97/59.94Hz for videos shot at that frame rate. I’ll start testing with ZDMC. Automatic frame rate switching is already enabled, but you’ll have to go to System->Audio output to enable passthrough. 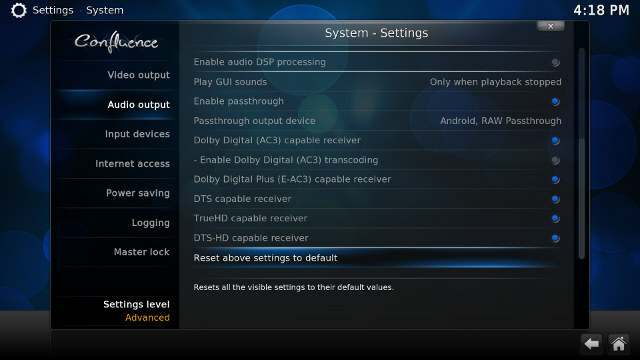 As you can see from the screenshot above Dolby Digital (AC3), DTS, TrueHD, and DTS-HD are all available, and I enabled them all since the codec are supported by Onkyo TX-NR636 A/V receiver, which I’ll use for this review. 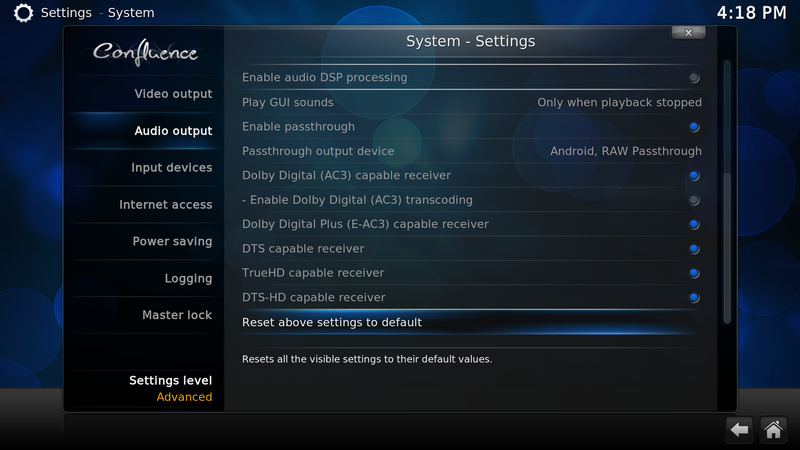 Dolby Atmos 7.1 – TrueHD 7.1ch. Onkyo TX-NR636 receiver is supposedly Atmos capable (Since September 2014), and I have the latest firmware, but I’ve never been able to play Atmos content. That one is very good with the only question marks being Atmos and DTS:X support. That’s some improvement but still not perfect, and I was expecting better 4K video support. Hopefully most of the issue will be fixed before I complete the full review. You can watch 4K videos in ZDMC and Media Center, as well as HDMI audio passthrough testing in ZDMC in the video below. Would app store app spmc work? Most likely not very well, since AFAIK, the developers have not (and are not going to) worked on Realtek SoC. It’s mostly RTD1295 hardware limitations: 4K VP9 @ 30 fps, 4K H.265 @ 60 fps, and 4K H.264 @ 24 fps. It helps to find which videos are supported. The block diagram actually shows VP9 @ 60 fps, but I’ve been told it will be hard over 30 fps. I assumed 4K VP9 / H.265 up to 60 fps, and H.264 @ 30 fps before the review. I missed it won’t play 4K H.264 videos over 24 fps. There going to be problems for customers? The line above is true, except for VP9, which I’m told is limited to 30 fps. It depends what kind of 4K content people are watching. If it is within specs then no problem. I recommend to buycott all hardware using RTD1195 and RTD1295 because Realtek’s fork of Kodi/XBMC violate the GPL license that its bound under as they are using a internal closed source player. The GPL only allow them you use an open or closed source external player or an open source internal player, but not a closed source internal player. Zidoo told me they’d release ZDMC sources for RTD1295 if customers request it. ZDMC do wrapper to external palyer(RTD player).not kodi internal palyer,RTD player not need to follow the GPL.About ZDMC changed something fork on kodi,we will open source. @mirror No that RTDplayer is technically an internal player in Kodi’s architecture so it still violate the GPL. If it was an external player then you could use is as a stand-alone player, like MXPlayer, which you cannot with RTDplayer. RTDplayer is currently made explicitly as an internal player for Kodi and cannot be used seperatly. Just as you cannot use Kodi’s owm DVDplayer as an external player. Zidoo and all others using Realtek’s RTDplayer violate the GPL as the design is today. Saying that it is external player just because it is written by third-party does not make it so. Ok then please request the source code for Realtek code and see if you fare better. I and others already have but it is Realtek that will not release the source code to RTDplayer, even though they are required to because YES IT AN INTERNAL PLAYER and YES IT STILL VIOLATE GPL. This has been explained to Zidoo and others using Realtek SDK by KOdi developers on their forum but Realtek and their partners just don’t understand what they can and cannot do with GPL licensed code. They tried to implement a “wrapper” that they think makes the player and external player but it does not, it still counts as an internal player. This is explained in the GPL FAQ. I believe Zidoo does not violate the GPL on purpose, it is Realtek who have said that their wrapper workaround does not violate GPL and their partners like Zidoo are just to naive when it comes to GPL to understand. Hi @cnxsoft, would you share links to download the 3 video samples that failed? Just realized I made a mistake as to which types failed or don’t play as well via native/external player (which is the preferred player for 3D, especially, and overall due to better PQ than ZDMC). Re: webm format, do we care? I’ll test/re-test these two, which I do have: (1) HD.Club-4K-Chimei-inn-60mbps.mp4, and (2) big_buck_bunny_4k_H264_30fps.mp4. I don’t have this one; know where I can get them? (1) BT.2020.20140602.ts (H.265 Rec.2020 compliant – AAC audio). I have a few VP9 in mp4 (not webm) format (downloaded from YouTube), and can confirm they don’t play 100% smoothly. I’ve also been thinking that many 4K videos will be using H.264 @ 30fps because of all smartphones and cameras around there recording at that “format”, and those videos won’t play well on Zidoo X9S due to the hardware being limited to 4K @ 24 fps. 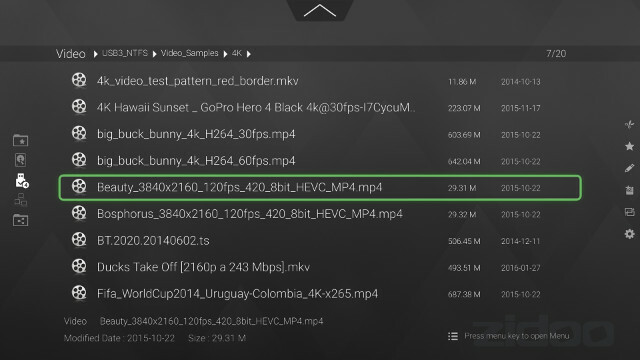 For that reason HD.Club-4K-Chimei-inn-60mbps.mp4, and big_buck_bunny_4k_H264_30fps.mp4 do not play smoothly (both are ~30 fps). About webm. I don’t know, and I don’t want to speculate. I just test them (they can be downloaded from YouTube too) to let know people know, then they can decide themselves if they care. It will be great if you could tell us where to download the sample files so we can do the same tests on our devices and report accordingly.